The eight My Mood Stars enable children to immerse themselves in imaginative play, either by themselves or with others. This offer is a fun opportunity for children to talk about how they are feeling. Use the stars and their board to set the scene for endless stories and games to be made with characters being shy, sad, angry, happy, sleepy, surprised, scared and silly! An AMAZING "Calm Down TOOLKIT" Option. Self-confident children in touch with their feelings find it easier to flourish in social situations. Indeed personal, social and emotional development and communication are key aspects of the early years foundation stage in the UK. Children who understand and can express and manage their own emotions, as well as those around them, or more likely to develop a positive sense of self and be assured and inquisitive learners. 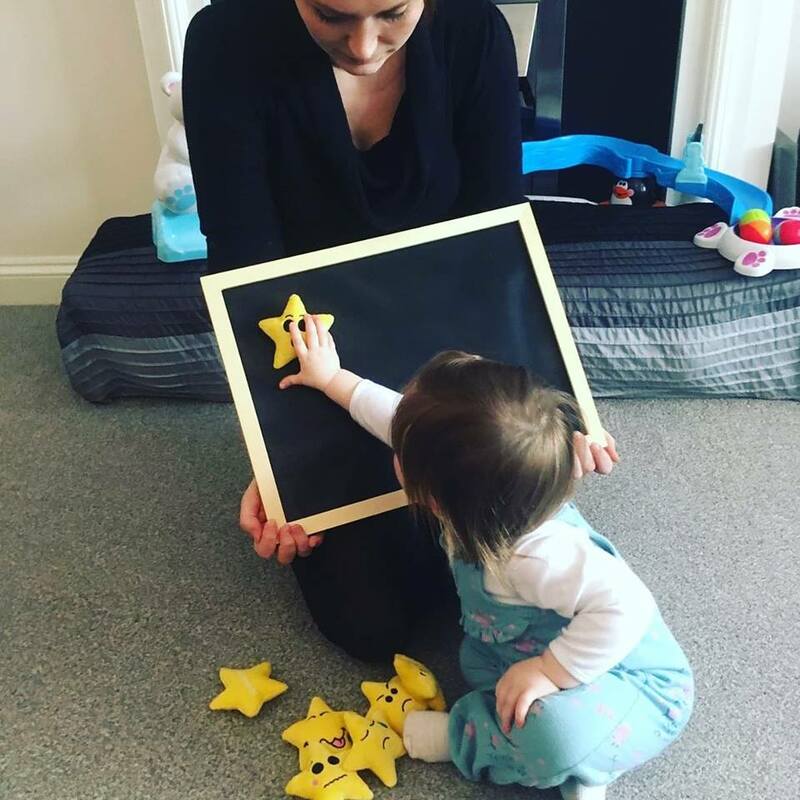 Children love the tactile experience of popping there My Mood Stars on and off their very own specially designed self-adhesive board, which works as a Velcro like substance on the soft and cuddly skies stars themselves. The My Mood Stars board can be hung on the wall or propped up on the floor or a chair. "Encouraging and emotional development was always a priority for me during my long career as an early years practitioner, leading me to design and development my moon stars"
My Name is Wendy – founder of Wendy Woo Educational toys! I would like to introduce you to My Mood Stars. I developed My Mood Stars while caring for children while their parents were at work. I have always found that acceptable social behaviour is key to a child’s happiness, success and popularity. My Mood Stars are becoming increasingly popular with families of children on the autism spectrum to help them recognise and acknowledge expressions and facial cues. My Mood Stars are unique in as much as they are a tactile resource that can be carried around just like other soft toys bringing comfort and reassurance. My Mood Stars come with their own My Mood Stars board onto which they can pop on and off for extended play and learning. Older kids have been able to vent out their emotions and turn anger into laughter as they throw the My Mood Stars onto the My Mood Stars board and watch them stick! My Mood Stars have also brought out their own My Mood Stars book which also encourages children to talk about, and make notes or drawings to show how they are feeling. Free games to play booklet! For fun play ideas and examples of how to use My Mood Stars effectively, visit WWW.mymoodstars.co.uk to download your free “games to play” booklet!